specifically exterior applications, including exposed aggregate and other decorative concrete surfaces. DECO SHINE provides a clear protective coating that brings out the radiance and luster of all natural aggregate and preserves a long lasting, durable finish. DECO SHINE is ideal for stained concrete, exposed aggregate slabs, walkways, swimming pool decks and walls. brings out the radiance and luster of all natural aggregate and preserves a long lasting, durable finish. 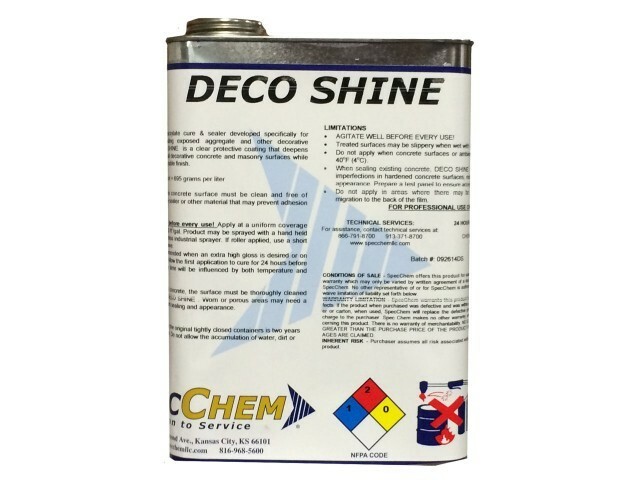 other material that may prevent adhesion of DECO SHINE. porous surfaces, another thin application can be applied the next day at 400 sq-ft/gal. Shine. Pressure washing with a strong alkaline detergent to remove dirt, waxes and oils is recommended. Acids will not sufficiently clean or remove dirt, curing compounds, or old sealer from concrete. Worn or porous areas may need a second application for uniform sealing and appearance. Allow 24 hours before 2nd application of sealer. In general, multiple thin coats (350-400 sq ft/gal) will provide a harder, more durable finish than a single heavy application. Dry time will be influenced by both temperature and humidity.